Gaining exclusivity as the “official sponsor” of a major professional sports team – or an arena, or a stadium – traditionally has been not only coveted by the brand, but also has been quite lucrative for the teams and facilities. So how do Caesars Entertainment, William Hill, and FanDuel, companies with much or all of their focus on gambling, each have deals with the New Jersey Devils and the Prudential Center announced within the past 10 days? MGM, meanwhile, last week became the first official sports betting partner of the National Hockey League and FanDuel has also partnered with the NHL. Not to mention, MGM, along with 888.com, both forged partnerships with the New York Jets, again within days of one another. Caesars, meanwhile, is sharing Prudential Center space as an online gambling operator with British bookmaker William Hill. While Caesars just announced plans for a 5,000 square foot “premium restaurant and bar” on the main concourse of the Devils’ Newark arena, William Hill will have a “sports lounge” with enough TVs and odds boards to give one the feel of a sportsbook, even though it isn’t one. Both gaming companies, along with daily fantasy giant-turned-sports-betting-competitors, have online sports betting apps that they would like to see become the preferred choice of Devils fans as well as convert visitors to the Prudential Center. Scott O’Neil, the CEO of the Devils, Philadelphia 76ers, and Prudential Center (all share the same ownership) has been working in the sports business business in the New York/New Jersey/Philadelphia market for more than 20 years. O’Neil said a shift toward multiple corporate sponsorships in similar spaces is not confined to gambling. He pointed to a growing number of Devils and Prudential Center deals with multiple beer sponsors, for instance. The same shift is occurring, he said, in partnerships beyond just sports. O’Neil said that negotiations are clear on both sides about what to expect regarding the extent of exclusivity in the deal. Don’t be surprised, either, to hear of even more deals between the Devils and gambling companies. The Vegas Golden Knights, who are heading into their second NHL season, have a partnership with William Hill that was the first of its kind in the U.S. But because Las Vegas and Nevada have had a 70-year head-start on the rest of the country with legal gambling, O’Neil said he is not surprised that franchise executives are following his deals closely. “We’ve been talking to a lot of teams around the NBA and NHL, and they want to know what we’re thinking,” said O’Neil, who previously has worked for the New Jersey Nets and for Madison Square Garden. An underrated aspect of the recent announcements is the plans by the 76ers to promote Harrah’s Philadelphia – a Caesars-owned casino – to its fan bases. Because the Caesars-76ers partnership is moving ahead a bit before Pennsylvania has launched either brick-and-mortar or online sports betting (though it’s coming soon) that relationship will be of interest to teams in other states who may now be less inclined to wait for their legislatures to approve the gambling before signing deals with gaming companies. 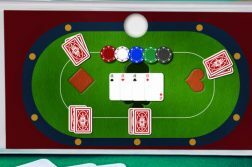 The New York Jets recent deal with 888.com is another example – though the team plays in New Jersey so its fans can bet on the games at MetLife Stadium, the NFL is much more hands-off on sports betting so the Jets are doing workarounds such as having 888 promote its online casino gaming site but not its legal sports betting site. As for MGM, that deal with the NHL is similar to the one MGM made with the NBA this summer. In both cases, MGM gets the right to use team logos and feature other direct tie-ins with the leagues – but in neither case is that, or the deal to receive league data, exclusive to MGM. But MGM will have the opportunity to reach out to the NHL’s fan database and promote its M Life Rewards program. MGM also will have a major presence at the NHL All-Star Game, the outdoor “Winter Classic” games and the Stanley Cup playoffs. 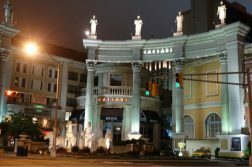 What Does Background Of New Caesars CEO Mean For Atlantic City?